President Robert Mugabe of Zimbabwe and his party the Zimbabwe African National Union – Patriotic Front (ZANU-PF) were in power since the country’s independence in 1980. However, this all changed on November 15, 2017 when President Mugabe and his wife, Grace, were forced into custody by the military. Nine days earlier, Mugabe had fired his vice president, Emmerson Mnangagwa, forging an unhindered path to power for his wife to become vice president. Once under house arrest, Mugabe resigned after thirty seven years in power. Another nine days following Mugabe’s arrest, on November 24th, ex-Vice President Mnangagwa was sworn in as president. How, in the course of eighteen days, did Zimbabwean leadership undergo such an unprecedented political shift? While questions will remain until the world witnesses the next moves of the current president, Zimbabwe’s history may elucidate mechanisms that led to the previous president’s political demise. Beginning in the mid- to late 1800s, European settlers began trading on the territory that would become modern Zimbabwe. In 1889, John Rhodes’ British South Africa Company successfully obtained a charter from Britain to colonize what first became Southern Rhodesia. At this point, white settlers immigrated to the country and by 1922, the colonizers decided to govern themselves. The minority government approved mandates to prevent black African access to farmland. From this time on, dissent among the majority, native, African population grew exponentially. One theory regarding the resulting civil organization due to mass discontent is referred to as peasant consciousness. This theory refers to the understanding of the communal grievances the “peasant”, or rural people, experience as a class, such as claims that white farmers and the state both acted to undermine native peasant farmers. The prevalence of peasant consciousness grew as the primary source of authority in the 1930s. During this time, the Southern Rhodesian state was so ineffectual, according to author Kim Shutt, that violence by whites against black Africans was the most effective form of control over the peasant class. In fact, the colony lacked a functioning bureaucracy capable of imposing any form of discipline. As is the case in modern politics, those disillusioned with the colonial government and harbouring resentment against the white elites sought concrete solutions. In 1965 Prime Minister of Southern Rhodesia, Ian Smith, “issued a Unilateral Declaration of Independence from the UK” after being denied independence from Britain due to lack of proof that his regime would transition to a majority government. As a response, in April of 1966 the United Nations Security Council authorized the use of force by the United Kingdom against Southern Rhodesia to prevent oil imports from reaching the colony. By December the Security Council imposed economic sanctions. Shockingly, peasant consciousness remained a powerful force of mobilization throughout this period and was “highly conducive to mobilization of guerrilla war” in the 1970s. 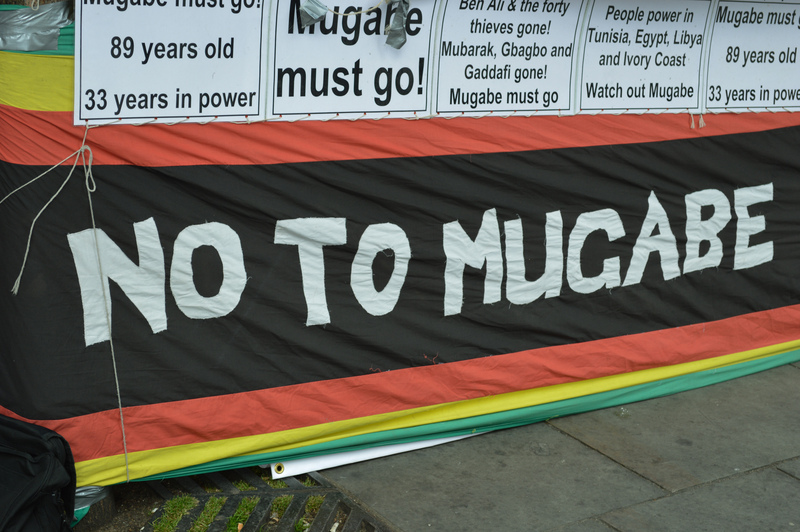 The modern Zimbabwe African National Union – Patriotic Front (ZANU-PF), merged from two nationalist groups, the Zimbabwe African People’s Union (ZAPU) and Zimbabwe African National Union (ZANU), to fill the void left by the colonial state. Mugabe rose to power as an outspoken proponent of independence, highly critical of capitalism and colonialism. The country’s woes, per Mugabe, were perpetrated by Western countries, and therefore the people of Zimbabwe could only improve their lives through unwavering nationalism. The political icon spread this nationalistic message while emphasizing the socialist platform of his party, the ZANU-PF. The party engaged in guerrilla warfare until 1979 when the United Kingdom stepped in to help write a new constitution implementing majority rule. Zimbabwe became an independent state on April 18, 1980 and elected its first prime minister and, following a 1987 Constitutional amendment, president Robert Mugabe. The ZANU-PF based its platform on grievances experienced by the “peasant class”, that is black farmers and landowners. They promised economic prosperity and eventually restitution of land from white to indigenous farmers. In keeping with this promise, the UK and Zimbabwe negotiated the Lancaster Agreement in 1980, which would restore land to grieved, native farmers. A section of the agreement included that for ten years post-independence, white farmers would enjoy protection from unauthorized land seizure. However, in 1985 Parliament amended its constitution to circumvent these clauses. Thus, the government forced resettlement of white farmers in what is called the Land Acquisition Act. While initially seeming promising, resettlement was sparse and most black Africans were still confined to reservations with essentially infertile land. During this time, the Mugabe administration also promised to reintegrate previous guerrilla fighters; awarding them a small pension. This compounded economic strain because the country already had a history of economic instability and debt. By 1991, following the worst drought in over a century and the resulting recession, the World Bank intervened with the Economic Structural Adjustment Program (ESAP). The ESAP sought to transition the Zimbabwean economy from that of a heavily regulated colonial system to an open, independent one. This entailed “quick dispersing loans” from the World Bank to fund state initiatives aimed at expanding the economy. The program had mixed results, at best. The World Bank Group stated in its independent evaluation that while the manufacturing factor did grow, the civil service sector remained prohibitively bloated and costly and intended social programs never came to fruition. Along with this, a Human Rights Watch report cited steady increases in inflation and interest rates throughout the 1990s. By the end of 2000 the number of occupiers, black Africans, on farms quadrupled, but land was cited as unusable in some cases. The bureaucratic process was inefficient, replete with errors, and disorderly. In 2001 Mugabe edited the Act, reducing the amount of time previous occupiers, e.g. white farmers, could halt farm operations and leave their land to just ninety days in what was referred to as “fast-track resettlement.” Many interested in pursuing land ownership declined the opportunity because they did not have the resources to cultivate the land. There was also little guarantee new farmers would have “security of tenure” per Human Rights Watch. This disincentived investment because farming requires enormous upfront costs for equipment, infrastructure, and livestock. Profits are also amassed in the long-term following growing seasons, for example. Therefore, the threat of losing land after a short time could be economically devastating for new farmers. Some argue that the disorganized nature of land seizure and pushing out the base of Zimbabwean agricultural production were the causes of the severe economic downturn in the mid-2000s. By 2008, hyperinflation rendered the Zimbabwean dollar nearly worthless, about “Z$35 quadrillion per US$1.” The effect on the population was devastating, to say the least. Salaries were worth nearly nothing and continued to fall in value. The country was at a standstill with government services halted, hospitals closed or without basic supplies, and school teachers earning next to nothing. Zimbabwean people interviewed blamed Mugabe’s policies, which is important because voters attributed blame to a branch of government that could, theoretically, be voted out of office or reformed through public displays of discontent. 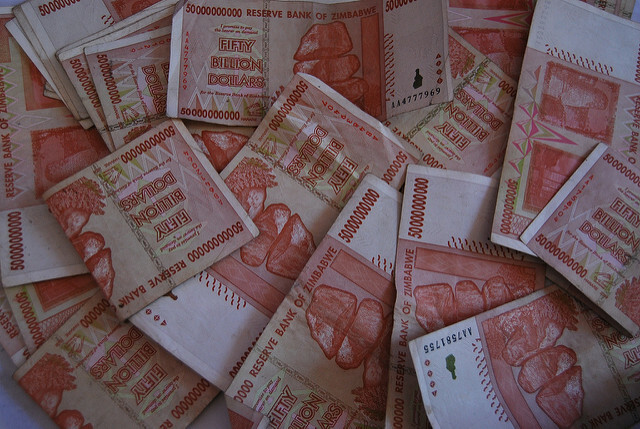 In 2009, the government authorized a mixed currency basket consisting of majority South African Rands and United States dollars to get Zimbabwean currency out of the system and reduce inflation. By 2016, the currency equalized at Z$1 per $1USD thanks to the multi-currency basket, but unemployment soared to an estimated 95%. The country entered a “liquidity crisis” where cash was nearly impossible to obtain and queues of hundreds of people would build up in front of ATMs everyday to withdraw money despite government constraints. The dire economic situation in the country may have been the final nail in Mugabe’s theoretical coffin. Widespread discontent over the state of the economy mobilized protests in summer of 2016. The public expressed fear of a repeat of 2008 when the federal reserve released its plans to accept $200 million USD of bond notes from the United States to avoid issuing Zimbabwean dollars. A perception of unchecked corruption within the ZANU-PF further reduced confidence in the regime. Former vice president and Mugabe’s “Right hand man” and “ruthless enforcer“, Mnangagwa took power following Mugabe’s resignation. As mentioned above, it was only days before that Mnangawa was fired by the former president. In fact, Mnangawa was in South Africa to protect himself from possible political retaliation until Mugabe announced his resignation. At his swearing in ceremony, Mnangagwa promised to rebuild the economy and re-engage with Western countries that had cut ties with Zimbabwe following the implementation of fast-track land acquisition and later the economic crisis. Although his role in the military intervention that overthrew Mugabe is not known at this time, he mentioned in his first speech as president that he was in contact with military leaders from his refuge in South Africa. Were he involved, questions would arise as to the role of the military in politics and whether this relationship will impede democracy. Despite the jubilation of the crowd attending his acceptance speech, the public is unsure whether anything will truly change in Zimbabwe because the ZANU-PF remains in power. In fact, former Mugabe allies were detained without bail on charges of corruption at the time of writing. It remains to be seen whether these charges will be tried following legitimate judicial procedure. If not, it is likely a threat to Mugabe allies and the opposition from the military and current regime in power. Mnangagwa could purge the bureaucracy of Mugabe allies in order to reward his own followers with employment, further removing any possible dissidence against his rule. The true and possibly more visible test to Zimbabwe’s democracy will be the results of the July 2018 federal elections. International observers claim, however, that Mnangagwa and the ZANU-PF did not enter power to lose it in upcoming elections, meaning that it is unlikely that future elections will result in any drastic political change.